Need a pair of comfortable dressy shoes, pumps, sandals, 2 1/2 ” heel to go with a raspberry lace sheath dress. Very bad bunions and big toe that crosses over. Help. Size 8 1/2. I try to get the widest width I can to go over my very prominent bunions , but sometimes the heel slips then and it doesn’t work. Sling backs are the best option for me when I can find a wide width shoe. What you want is a deep toe box, that is deep from top to sole, and a soft material on top. I suggest you take a look in the “Bridal-Dyeable” Collection and look for slingbacks with this configuration. Do not buy them too wide if your foot is not really wide. I’ve included a photo of a shoe with a rhinestone oval ornament. It is stretchable (wider only) and dyeable. Then… get or find a good shoe repair place. You will need to have them both dyed to the color you want AND spot stretched to accommodate the “issues” around your forefeet. Only spot stretch where necessary but do it enough that you will be comfortable. You should find a much wider range of the heel height and silouette you want in the bridal – dyeable styles. 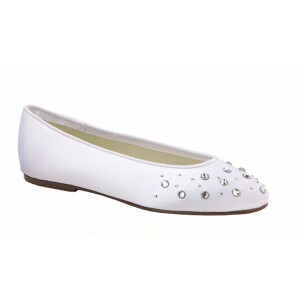 They are all white but can be dyed to match your dress, or maybe a soft grey or paler pink. My daughter is getting married in August and I would like your advice on the best shoe style for her feet. She is not used to wearing heels so the following styles would all be okay. Ros Hommerson Bono in White: Trotters Dora in White: Special Occasions Hillary in White. Her foot measurements are Length 10.7 inches and width 4.50 inches. She also has quite a high instep. I look forward to your advice. Anything for an Aussie! I’ll give you my best suggestions. Let’s deal with size first, then with style. Given her foot measurements, I recommend a size women’s size 12 wide. Size 11.5 would work but there are virtually no wedding shoes in this size. The width measurement suggests a Wide edging toward the “extra wide”. But since you’ll get a size 12 , it will probably be slightly wider than the 11.5 would be . If her feet are thick (top to sole) and if it will be hot so they might swell (how hot is it there in August?) you may want to consider a 12WW. But I think a 12W should do. I am going to suggest that you look at the fabric shoes designed for brides. They are easy to spot stretch if she needs a little more width. And, this is the big one, after the wedding she can have them dyed a different color, like hot pink (a personal favorite). Now for the style. Attitudes toward wedding shoes are going through changes. My FAVORITE daughter in law, Victoria, got married in baby blue pumps and a white wedding dress. We are seeing more people opt for colored shoes with their white dresses. Just an option. This is her wedding and she should have fun with her apparel choices! 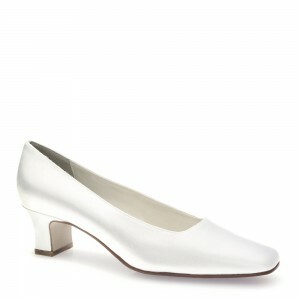 I’ve used the “Shop For” section at DesignerShoes.com to find Bridal/ Dyeable Collection shoes in size 12W.